Johannesburg, 18 September 2018 – Fear of the dentist is known as odontophobia, dentophobia, or more casually as dental anxiety. As dental professionals, and not mental health professionals, our focus isn’t as much on why people are afraid of the dentist, but instead on what we can do for those who are, so that they can receive compassionate and effective treatment. It is important to remember that some studies estimate up to 75% of dental patients experience mild to severe dental fear. So it’s actually more likely for a person to be uncomfortable with the idea of being in a dentist’s chair than not. At Dentsply Sirona, we are focused on empowering dental professionals to provide better, safer, faster dental care. We work with dentists to envision what‘s possible and provide innovative solutions to achieve it. Education and support help move each procedure forward, ensuring the benefits of our innovations are realised. Everything we do is about helping dental professionals deliver the best possible dental care, for the benefit of their patients and practices – today and for years to come. Imagine that you could now receive all the treatment you require in a single visit with the best results possible in modern dentistry? Dentsply Sirona ‘s CEREC makes exactly this possible. Dentsply Sirona have been driving CAD/CAM innovation for over 30 years, pioneering digital solutions that have changed dentistry for the better. CEREC enables dental professionals to provide you the patient with restorations, including inlays, on lays, crowns, bridges and veneers, in a single visit. Our solutions also enable them to take digital impressions and produce surgical guides and other apparatus needed for better, safer, and faster implants and orthodontics. 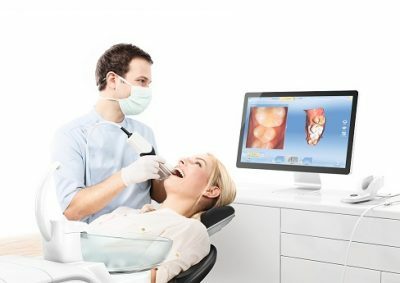 Cerec stands for a quick and pleasant treatment with no impression tray, no annoying temporary prostheses and only one anaesthetic injection. A win-win situation: You receive the highest standards and get the best treatment all in one visit. Digital planning of the restoration allows you the patient to see what will be done, thereby creating transparency and eliminating costly and unnecessary visits.